Investigators with the Ohio Division of Natural Resources pose with illegally harvested wildlife seized during Operation North Coast. COLUMBUS – The Ohio Department of Natural Resources (ODNR) has closed the adjudication phase of what has become the largest case in the 146-year history of the ODNR Division of Wildlife. The case, dubbed Operation North Coast, culminated in March 2016 with the execution of search warrants, arrest warrants and dozens of simultaneous interviews. The case primarily concerned the illegal taking and sales of Lake Erie sportfish and white-tailed deer meat products in counties along the Lake Erie shoreline. Since the takedown, state wildlife investigators have spent 2.5 years attending court hearings in Cuyahoga, Lorain, Lucas, Richland, Ottawa and Wood counties. Following the initial search warrants and interviews, state wildlife investigators reviewed thousands of documents, conducted approximately 200 interviews, executed additional search warrants, examined hundreds of digital and physical evidence items that were seized and attended approximately 100 court hearings. Of the items seized were one vehicle, 96 deer and turkey mounts, 35 sets of antlers, more than 200 pounds of filleted sportfish and 400 pounds of de-boned venison and processed deer meat. Nine defendants, including one in Wood County and eight in Cuyahoga County, were subsequently charged with engaging in a pattern of corrupt activity and associated crimes for operating as a criminal enterprise. 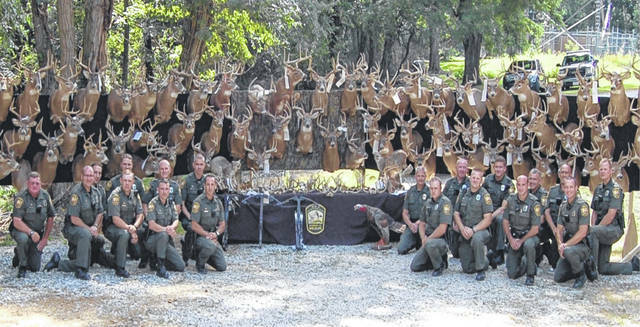 The ODNR Division of Wildlife asserted that members of the group took deer illegally, often not tagging or reporting the harvests as required by law. The group would also create false harvest records by checking deer in the names of others to cover illegally taken deer meat and/or antlers. The agency further asserted that the deer meat was laundered into venison “smokies” that were sold or bartered for taxidermy and other services. In Cuyahoga County, John Zayac, John Stofan and Terrance Ankrom harvested 39 deer, including 22 bucks, or antlered deer, over the two-year course of the investigation. (The bag limit is one buck per year per person.) The group would have their spouses and family members commit communications fraud and falsify records in the ODNR Division of Wildlife’s game check system. The deer were then de-boned and transferred to Zayac, who would take the de-boned venison to Smokin’ T’s, a meat processor in Ashtabula County for processing. The following penalties were assessed by the Honorable Judge Michael Donnelly in plea agreements. John Zayac paid $40,000 in restitution, had his hunting privileges revoked for seven years, forfeited a truck and 44 of the 54 seized deer mounts were forfeited to the ODNR Division of Wildlife. John Stofan was ordered to pay $25,000 in restitution, lost his hunting privileges for five years and 31 of the 35 deer mounts were forfeited to the ODNR Division of Wildlife. Terrence Ankrom was ordered to pay $6,800 in restitution, forfeited a truck and lost his hunting privileges for five years. Todd Neczeporenko’s business pleaded to a lesser charge and was ordered to pay $15,000 in restitution. In Wood County, Mandon Freeworth would harvest white-tailed deer illegally and have others commit communications fraud, a third-degree felony, by reporting the harvest as their own in the ODNR Division of Wildlife’s game check system. Freeworth was charged with 16 counts including the following 10 felonies: engaging in a pattern of corrupt activity, discharging a firearm from a motor vehicle, felony sales of wildlife, possessing weapons under a firearms disability, improper handling of a firearm in a motor vehicle, tampering with records and drug abuse. He was also charged with six misdemeanors including possessing weapons while intoxicated, licensing violations, improper handling of a firearm and three counts of selling venison. Freeworth pleaded to 10 of the charges and served 22 months in prison. He paid $5,513.03 in restitution and has lost his privilege to hunt, fish and trap until 2035. An additional 21 associates of Freeworth were charged with 39 crimes including misdemeanor purchases of wildlife (processed venison), providing false information to the division’s game check system, possessing weapons under a firearms disability, tampering with records and hunting without permission. In a unique case documented by investigators, Matthew Langlois and Lawrence “Andy” Turner committed theft by deception when they entered and won a walleye tournament on the Maumee River. The fish they had entered had actually been caught on Lake Erie, yet they entered the fish and won $375 in prize money. In addition to their $250 fine and 30-day suspended jail sentence, the two had to reimburse Maumee River Bait and Tackle for the prize money. In Lorain County, Carl Taylor Jr. and Alexander Lenz sold more than 100 pounds of sport-caught perch, walleye and white bass to investigators, which is a felony by statute. Taylor pleaded to the 11-count indictment and was ordered to pay $10,700 in restitution. Lenz was ordered to pay $2,500 in restitution, and both lost their fishing privileges for one year. Also charged in Lorain County Common Pleas Court were Dennis and Andrew Urig for felony sales of white-tailed deer meat. Investigators documented the pair selling processed deer products from a storefront they owned. The two pleaded to the cases. Dennis Urig paid $3,663.30 and lost his hunting and fishing privileges for six years. Andrew Urig was ordered to pay $1,340 and lost his hunting and fishing privileges for three years. In Richland County, Ron Gasparac was charged with three felony counts of selling yellow perch fillets. During the investigation, Gasparac was documented six times of over-harvesting yellow perch on Lake Erie, at times more than twice the daily bag limit. He would then clean and sell the fish. Gasparac’s attorney challenged the state’s wildlife restitution law to the appeals court, but the court ruled in favor of ODNR, supporting the legal process the agency uses to establish the values of wild animals. Gasparac was sentenced to pay $6,120 in restitution to the ODNR Division of Wildlife for the value of the yellow perch and two years community control (probation). In all, the cases resulted in 46 defendants being charged with 91 felonies and 73 misdemeanors. These 46 individuals were assessed a combined $131,763 in fines and restitution, sentenced to 8.6 years of jail with the majority suspended, received 79 years of hunting and fishing revocation and paid more than $18,000 in court cost. The ODNR Division of Wildlife would like to thank the concerned citizens who reported information to state wildlife officers and through the Turn-In-a-Poacher (TIP) hotline at 800-POACHER (762-2437). In addition, the division would like to acknowledge the Ohio Department of Public Safety’s Ohio Investigative Unit; Will Ogden, an Ohio Buckeye Big Bucks official scorer; Henry County Prosecutor Gwen Gebers-Howe; and Cuyahoga County Assistant Prosecutor James Gutierrez.